Since its colonization of indigenous lands, the United States has built its immigration policies on principles of racial exclusion and exploitation. The immigration struggles that our communities face today are not unique to the Trump administration but are the culmination of a series of discriminatory policies on which this country was built. The Naturalization Act of 1790 established citizenship for “free white persons,” excluding millions of enslaved African Americans who were forced to give their lives and freedom to build America. The Chinese Exclusion Act of 1882 suspended immigration of Chinese laborers and set a precedent for the establishment of discriminatory race- and class-based immigration laws in the U.S. In 1996, the Clinton administration implemented the Illegal Immigration Reform and Immigrant Responsibility Act, which laid the groundwork for the immigrant criminalization and deportation policies we have today. In 2002, the Bush administration launched the Secure Communities program and began 287(g) agreements, essentially deputizing local police officers with immigration enforcement power, which paved the way for current anti-sanctuary legislation in states across the country. Under the Clinton administration, 12 million deportations occurred between 1993 and 2000; under the Bush administration, over 10 million deportations occurred between 2001 and 2008; and under the Obama administration, 5 million deportations occurred between 2009 and 2016. President Trump is exploiting the tools and infrastructure set in place by previous administrations to (1) expand the definition of who should be banned and deported and (2) militarize federal agencies and build up the deportation machine. The MUSLIM BAN is linked to REFUGEE policy, which is linked to TPS, which is linked to DACA, which is linked to H1-B AND H-4 VISA policy, which is linked to WORKSITE RAIDS, which are linked to FAMILY IMMIGRATION, which is linked to DENATURALIZATION, which is linked to DEPORTATION, which is linked to INCARCERATION — which all together comprise a broken immigration system. By terminating the Deferred Action for Childhood Arrivals (DACA) program, rescinding temporary protected status (TPS) for people from certain countries, issuing the Muslim ban, and banning certain refugees, the current administration has made clear that its agenda is to bar entry of immigrants and deport both documented and undocumented individuals. Our immigration struggles are linked to this larger agenda of exclusion and expulsion. In January 2017, President Trump signed an executive order essentially prohibiting people from seven Muslim-majority countries from entering the U.S., a policy now referred to by many as the Muslim ban. As a result of legal challenges brought against it, Trump has issued three different iterations of the ban, the third of which is awaiting a decision by the Supreme Court. Refugees who are racialized as Black and/or Muslim have also been barred from entering the country. In the first three months of 2018, 5,225 refugees have been resettled in the United States, a 65.8 percent drop from the first three months of 2016. Only 11 Syrian refugees have been granted entry into the U.S. in 2018. In June 2018, Attorney General Jeff Sessions and the U.S. Department of Justice established a “zero tolerance policy” to criminally prosecute asylum-seekers as they enter the U.S. This administration has not only made it impossible for immigrants of color to enter the U.S., but has forced our communities to live in constant fear of deportation. Individuals from countries on the Muslim ban list, such as Syria, Somalia, and Yemen, are also facing the rescission of temporary protected status (TPS). TPS enables nationals of designated countries who are in the U.S. to live and work here if their country is facing war, disease, or natural disaster. Often these conditions are a result of previous U.S. intervention in these countries and result in long-term, endemic challenges that require decades of recovery. Desis Rising Up and Moving (DRUM), based in New York City, coproduced (with MoveOn and United We Dream) a video that connects the fight to protect DACAmented and undocumented folks with the fight against the Muslim registry. DRUM is also addressing an additional concern about personal information provided by both TPS and Deferred Action for Childhood Arrivals (DACA) recipients being at risk of cross-agency data sharing. There is no guarantee that U.S. Citizenship and Immigration Services (USCIS) information on current and former recipients of TPS, DACA, and their undocumented family members is not accessible by U.S. Immigration and Customs Enforcement (ICE) and U.S. Customs and Border Protection (CBP). Undocumented immigrants and temporary visa–holders registered for these programs in confidence that their personal information would not be used to deport them, and now their trust and safety may be violated. This administration has drawn a wedge between recipients of DACA and H1-B and H-4 visa–holders. Some H-4 visa recipients feel that their struggle has been overlooked by the “noise” on the DREAM Act. This administration uses divisive tactics to make it harder for immigrants to stay in the U.S., whether they are H1-B and H-4 visa–holders or TPS or DACA recipients. If and when these groups lose their status, they become part of the ever-expanding population that’s particularly vulnerable to being deported. This is an opportunity to confront the larger white supremacist deportation agenda led by this administration, which has failed to create meaningful pathways to permanent residence and citizenship for all immigrant communities. As part of this administration’s ongoing deportation agenda, the last six months alone have seen the largest workplace raids under the Trump administration. Nearly 200 individuals were arrested and detained in Tennessee and Ohio, and one-hundred 7-Eleven stores were raided across the country. In their continued attack on low-income immigrants and families, the Trump administration is intending to expand the criteria for finding that a person is likely to become a public charge, i.e., likely to become dependent on the government for subsistence. An immigrant found likely to become a “public charge” may be denied a visa or lawful permanent resident status. Under a new proposed rule whose provisions were leaked to the press earlier this year, a person could be found likely to become a public charge if they were unemployed, retired, and/or disabled — or if their U.S. citizen children benefit from the Children’s Health Insurance Program (CHIP), SNAP (“food stamps”), or if they attend Head Start. Penalizing immigrants for utilizing social services is a calculated policy by this administration to limit legal permanent residence, and it represents a direct attack on the possibility of immigrant families here reuniting with their loved ones abroad who are seeking to immigrate. Another deliberately anti-immigrant piece of legislation, H.R. 4760, the Securing America’s Future Act (also known as the Goodlatte bill), which will come to a vote any day now and is being framed as a compromise solution for DREAMers, attacks family immigration by cutting entire categories of visas that help families reunite. The Goodlatte bill also would criminalize the undocumented population by making their mere presence a criminal violation. The bill also would separate vulnerable children and families seeking asylum at the border by sending parents to criminal proceedings and inhumanely placing their children in detention centers hundreds of miles away. Despite all these unimaginable enforcement-oriented provisions, the bill provides only temporary second-class protection to DACA recipients. This administration doesn’t limit its deportation targets only to visa-holders and undocumented immigrants, it is also quietly denaturalizing and deporting naturalized citizens through the U.S. Department of Homeland Security’s (DHS’s) Operation Janus. According to USCIS, failure to comply with any eligibility requirement for naturalization is subject to revocation of naturalization. DHS identified about 315,000 cases of “missing” fingerprint data from the centralized digital fingerprint repository. The U.S. Department of Justice filed civil denaturalization complaints against Baljinder Singh of New Jersey, Parvez Manzoor Khan of Florida, and Rashid Mahmood of Connecticut under Operation Janus. In January 2018, Baljinder Singh was denaturalized by the USCIS. 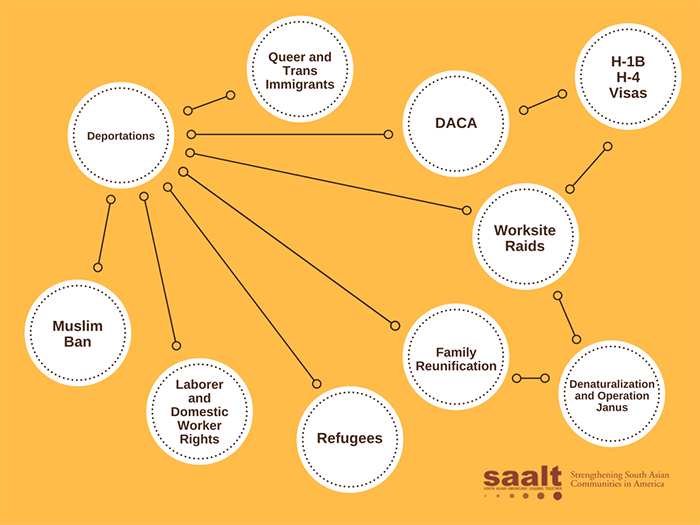 The administration has used an anti-immigrant and xenophobic political framework to promote an intersectional web of negative policies that affect all of our communities, and we must use an intersectional analysis to counter this violence and discrimination. This entry was posted in Uncategorized on June 15, 2018 by Richard Irwin.